For industrial storage containers to keep your equipment and materials secure and protected, turn to Haulaway. With over 50 years of experience with storage container units and our own proprietary designs, we’re able to provide diverse products that match every need. Whether you need mobile office units for additional space and storage or a large container to store construction equipment, we’re here to help. Our containers are made of 14-gauge steel with hardwood and steel floors, as well as our patented locking system for the best possible level of durability and security. Our proprietary “Rhino Locking System” provides the highest security in the industry for your inventory. Keep your product, equipment, vehicle, or small boat safe inside our units. Our units come in a variety of sizes, including custom sizes, so you can always find something that meets your needs. From ten feet to forty feet, you have a convenient and portable storage unit that can house anything from furniture during a home remodel to construction equipment or even a boat. 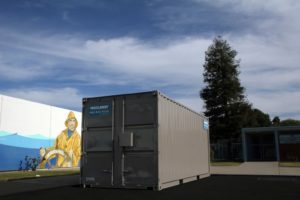 Our industrial storage containers function well in residential areas and business parks alike. Whether you’re a service provider, a contractor, or an office worker, we have the solution that’s right for you. We service the Western United States and conveniently offer our containers in most major cities in Arizona, California, Oregon, Washington, Nevada, Utah, and Colorado. Give us a call anytime to discuss our industrial storage containers and determine which one will be best for your needs. In addition to excellent storage solutions, Haulaway is dedicated to customer service. We are always happy to answer any questions. Call us now to discuss how we can help you.